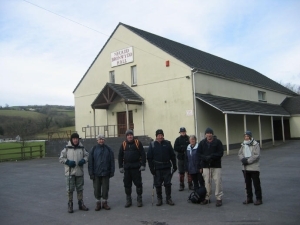 The village is approximately 3½ miles from Carmarthen in the Gwili valley. There is a steam railway in the village and several walks along designated paths. The hall was opened in June 1996. To hire the hall the cost is £14 per hour for outside bookings (there is a reduced rate for regular locals). The hall has a music licence and an alcohol licence. There is a stage in the hall that measures 29 foot by 16 foot. There is sound and lighting suitable for drama etc. Oil central heating. Take the A484 approximately 2 miles north out of Carmarthen. Turn right onto the B4301, crossing over the Gwili railway line. Continue through Bronwydd Arms for about a mile, and the hall is on the left hand side, set back from the road in a large car park.